One of the most precious memories for many parents is their baby’s first Christmas. You can make that day even more memorable with these adorable Snowflake Baby Booties – appropriate for any winter holiday – designed by Mary of Cute and Cozy Crochet. This pattern is presented on Day 28 of our 30 Days of Cozy. The pattern below includes sizes 0-3 months, 3-6 months, and 6-12 months. Purchase the ad-free, PDF of this pattern on Ravelry or Etsy. Measurement(s): Sole of feet: 3.5 inches for 0-3 month size, 3.75 inches for 3-6 month size, 4.25 inches for 6-12 month size. There will be no turning at the end of rounds. Continue working the same direction through the whole pattern. ch 1 will NEVER count as a stitch. Some embroidery knowledge is required for this pattern. Follow the chart provided to know exactly where to embroider the snowflake. The number before a stitch (2sc) determines how many stitches are to be worked in a single stitch from the previous round. The number after a stitch (sc 6) determines one stitch for each number of stitches from previous round. Instructions between asterisks (*) are to be repeated the amount of times mentioned after last asterisk. Round 5 will be worked in the back loops only, but all other rounds will be worked in both loops together. Embroider snowflake on side of each bootie using the diagram below. This pattern and its images are copyright protected and the sole property of Mary’s Cute & Cozy Crochet. The written pattern is for personal use only. Purchase of the pattern does not entitle the purchaser to redistribute, transfer, or sell the pattern or to alter it in order to claim as his/her own. 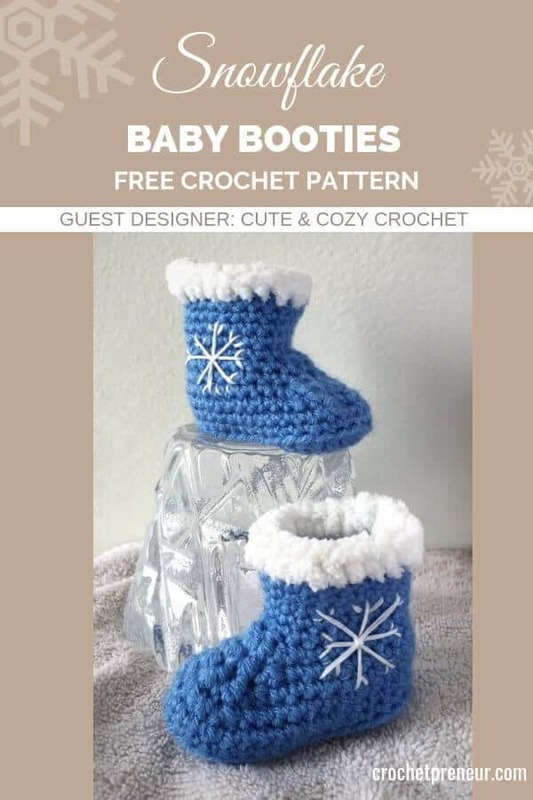 If you choose to sell the finished product, please credit Mary’s Cute & Cozy Crochet/Mary Gottwalt as the designer and provide a link to Cute & Cozy Boutique in your online listing. I hope you enjoy your finished product! If you have any trouble with the pattern, please e-mail me at cutecozycrochet@gmail.com and I’ll do whatever I can to help. I know you’re going to love making the Winter Snowflake Baby Booties and I so look forward to seeing your finished product. Mary is the designer and crochet lover at Mary’s Cute & Cozy Crochet. When she isn’t busy feeding, cleaning, clothing, snuggling, and playing with her 3 beautiful daughters, she spends her time designing and crocheting cute and cozy patterns for her loved ones. Almost all of her patterns have been designed and made for special people in her life or herself. Her favorite crochet patterns are amigurumi and baby items. Mary also has a strong addiction to chocolate and The Office. She lives in Nebraska with her husband and three daughters (and baby on the way!). Don’t lose this pattern! Pin this design to your favorite crochet board on Pinterest so you can find it later.